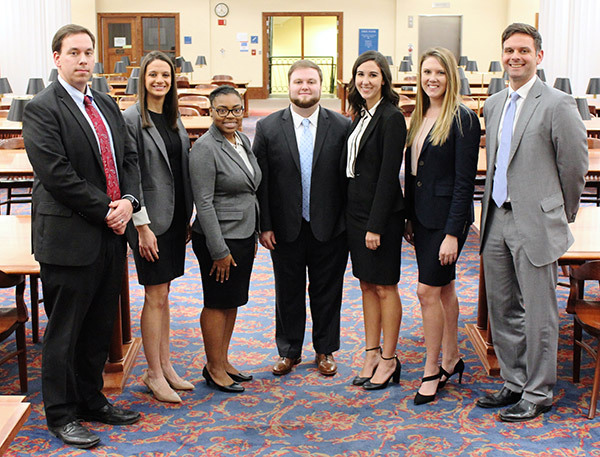 Two teams from Samford University’s Cumberland School of Law recently added to a victory streak for the school that began in late October. In Gainesville, Florida, at the Florida National Trial Advocacy Tournament, the Cumberland team won first place. The team, consisting of Allison Bendall, ‘19, Brooke DiSalvo, ’19, Dylan Sutherland, ’18, and Carmen Weite, ’18, earned Samford’s first-ever win at this particular competition. The team was assisted by Justice Neloms, ’19 and coached by Jeremy Hazelton, ’02 and Blake Milner, ’14. “Blake and I are incredibly proud of the amount of work and dedication each team member put into our championship effort,” Hazelton said. “Each one of them is a credit to our school, a credit to our trial program, and a credit to our profession." At the Tournament of Champions in Los Angeles, another team consisting of Amanda Wineman, ’18, Krista Tribble, ’18, Denzel Okinedo, ’19, and Walt Cobb, ’19, nearly advanced to the finals. They lost by one ballot, but were given positive comments from the judges who said the team could walk into any courtroom in the country and try a case. The team was coached by Mike Rasmussen, ’76 and Mike Eldridge, ’12. Maryellen Newton is a journalism and mass communication major and news and feature writer in the Division of Marketing and Communication.